Olympus-patented SIM scanner provides additional galvanometer scanning unit for region-of-interest stimulation simultaneous to imaging for optogenetic stimulation, uncaging, etc. Left: Crosstalk occurred after simultaneous excitation o GFP and DSRED with a single wavelength IR pulsed laser (950nm). Right: Two fluorescence proteins are clearly separated after individual excitation of GFP and DS-RED with a dual wavelength IR pulsed laser (950nm/1040 nm). 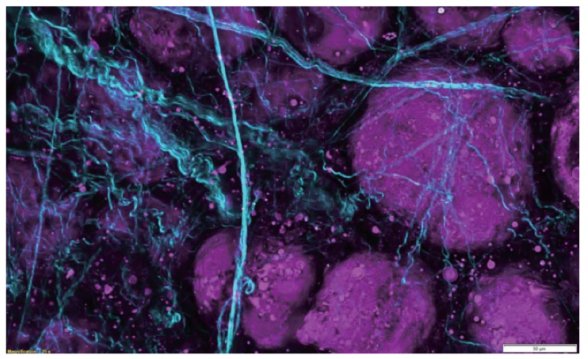 Optimized for best live-tissue and intravital multiphoton imaging. Widefield design maximizes fluorescence light capture. Correction collar provides correction for spherical aberration across a wide variety of tissue refractive indices 400nm-1600nm transmission coatings. Chromatically corrected for 700nm to 1300nm IR lasers. Third harmonic generation imaging of porcine adipose tissue; Unlabeled porcine adipose tissue was irradiated with femtosecond laser at 1250nm, second harmonic is detected from collagen fibers at 625 nm and third harmonic from lipid interlaces at 416 nm. Olympus GaAsP detectors provide approximately twice the quantum efficiency of standard multi-alkali PMTs. All non-descanned detectors are positioned as close as possible to the specimen and signaling optics have been enlarged to facilitate maximum detection efficiency of scattered fluorescence.